Get an incredible sensation of cleanliness and comfort using Allonature's beard soap. A great softness, a creamy texture and a shaving greatly facilitated. Moisten the face with hot water. Wet the shaving brush in hot water, wring it out to avoid waterlogging. Pass it on the soap and lather it in 2 or 3 turns. Apply the foam on the face until it is well on the skin and becomes creamy. Shave. After shaving, rinse the soap quickly under water to evacuate the remaining foam. For better preservation, let the shaving soap dry in the open air. 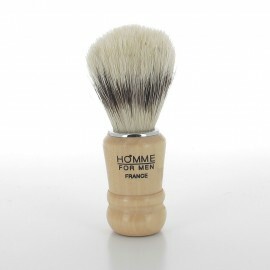 Even more effective with the use of a shaving brush. A smooth beard shave and great hygiene. An incredible care for your beard and for your skin. 100% des ingrédients du savon à raser sont d'origine naturelle. 75% des ingrédients sont issus de l'agriculture biologique.